I missed going to the Wales and West because someones naughty mare decided to foal 4 weeks early, at 10.30pm last night to be precise. 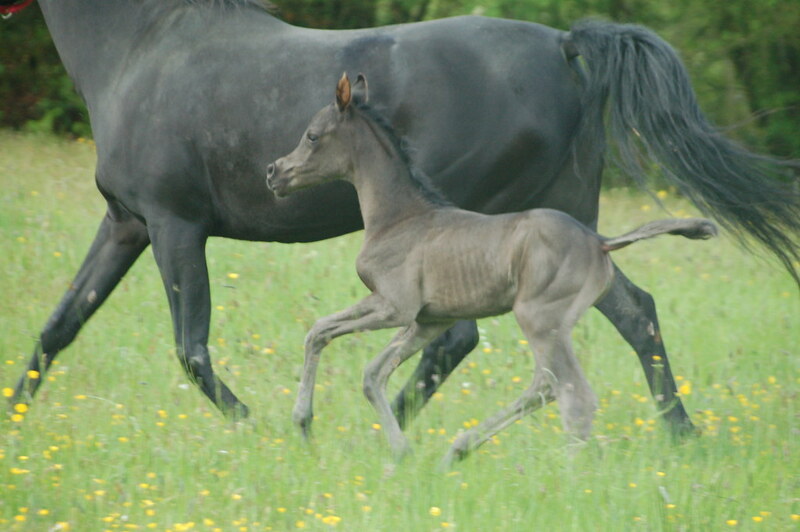 Aziza who is by Ariston out of the Simeon Sadik mare Sadika, belongs to Pat Hannay. Get the cheque books out now!!! bet Pat keeps her!!! Photos taken this morning at a few hours old. Vervaldee certainly has left us with some beautiful babies, what a loss ! Pat you are a 'jammy dodger', 11th filly in a row! Goodness Sue, only talking to Pat on friday evening about Izzy and she was saying that your vet reckoned she would have it within the week. Spot on! but one question, why the rug on the foal? Hi all - can't believe it's another filly - I was convinced this would be my first colt!!!! Now I will have the dilema of whether to keep her or sell her!!!!! Mustn't complain its probably a dilema you would all want! Many thanks to Sue and John for foaling her down - I did manage to make it in time as I left the Wales & West show and went straight down to Devon - but I do feel really guilty that Sue couldn't make it to Wales & West because of Izzie as she wanted to see the yearling filly she had bred being shown! Little babe is wearing a rug as she was abit shivery this morning (weather hasn't been too good has it!) and you must remember she was four weeks early!! Izzie foaled three weeks early as a maiden mare last year and we didn't know whether she would go to term this time or not - only got her down to Sue's last Tuesday just in the nick of time!!!! Attached is a photo I took of her last night when she was about twenty minutes old - taken on my phone so the quality is not too good!! I am sure Sue will take lots more to post as she unfurls!! Well what a lucky one you are !!!! 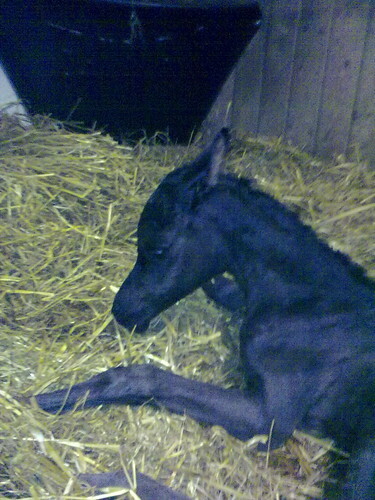 !another filly and black as well. I have just got back from seeing her and the photos really dont do her justice.She has the most excuisite head and gorgeous tippy ears.Also the smallest muzzle you can imagine.She is also quite tall for one born so early.I am sure Sue will get some more photos when she has caught up on her sleep. jane . Well dont to Sire and Dam, lovely filly! Huge congratulations Pat she is just gorgeous. My cheque book is out at ready but don't tell my Bank Manager.....you lucky thing she is fabulous. Sorry Sue missed her filly at Wales and West but Fayth (AV Montoya x G Fantastica) bred by Sue and John, did her proud and me too - second in her class and she went beautifully I was thrilled. We always give visiting horses pet names as I can never remember their real ones when they are here. Izzy is easy but still her name has morphed into 'Blackie'...... her baby is Dolly. China doll is all that comes into mind when I cuddle her! I'll try to get some more pics very soon. wow, stunning pat, many congrats! 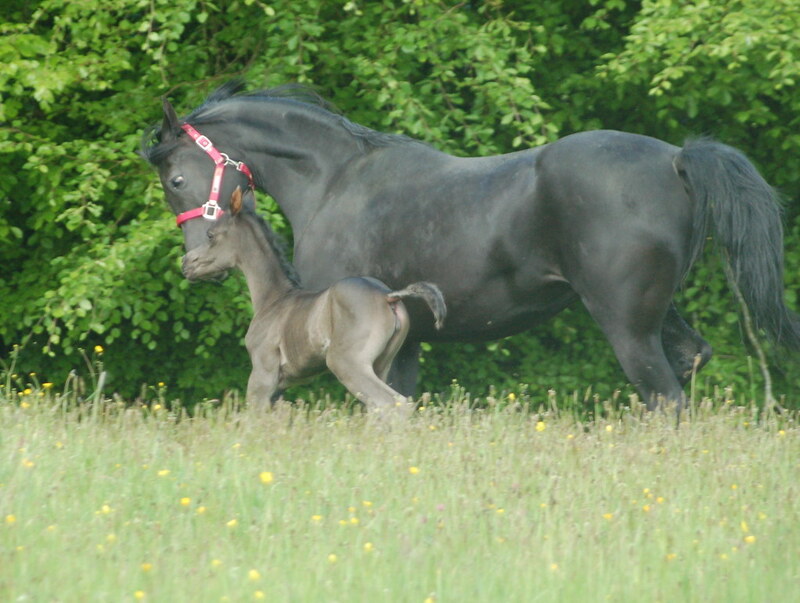 not suprised though a stunning black filly! we met at w&w, just wanted to say i love the halter i bought for my filly, she looks gorjus with it on!! We only popped them out for a short time between the showers.